Guess what I did? I tried everything at Society Bakery. Yep, attention all you chubby chasers out there I got my hands on a treasure box full of treats from the glorious Society Bakery on Greenville Ave and in the spirit of honesty, IT WAS AWESOME! Being the committed blogger I am, I swore that I would take at least one bite (ok fine, maybe 2) of everything offered to me in order to give the best review I was capable of. 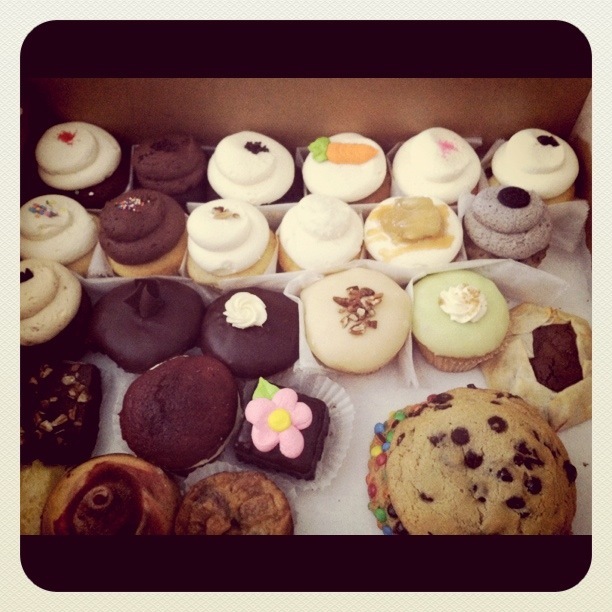 Don’t judge me, if someone handed you an enormous box of desserts you would take more than one bite of everything too-ESPECIALLY when the treats are as delectable as they are at Society Bakery. I almost passed out due to anxiety while driving home because I wanted to make sure these little fellas made it back without melting from the burn-your-flesh-off temperatures…or was it the overwhelming smell of sugar? It doesn’t make a difference because we (yes, we) made it home safe and it was all I could do to not smash my entire face into the box like a 3-year-old. Although you would normally find me housing down a bag of Cheetos over a cupcake, Society Bakery holds a very strong reputation and ever since I decided to review this lovely little spot I had been craving sugar like a diabetic. Not being one that would ever generally pick chocolate over a salt lick, Society Bakery may have made me into a, dare I say, chocoholic! I would love to sit here and discuss each and every item and what I thought about them but honestly, for the first time since starting these reviews, I don’t have anything negative to say. Of course I enjoyed some treats more over others but each was great in its own right. 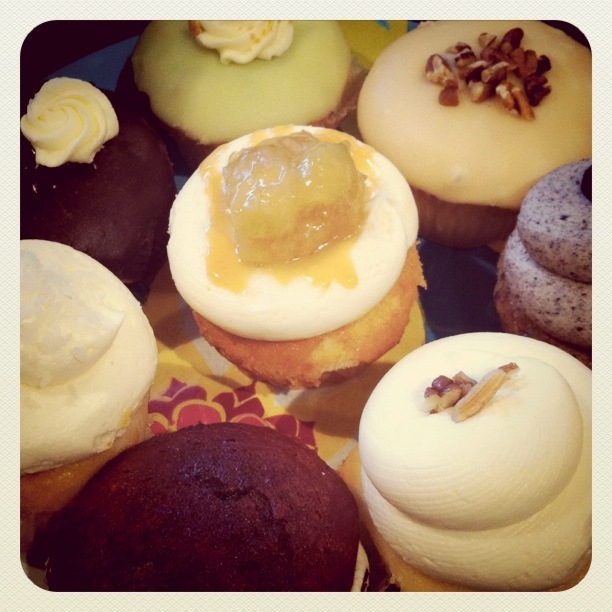 So, lets go with just a *few* high-high-highlights of my rendezvous with Society Bakery! 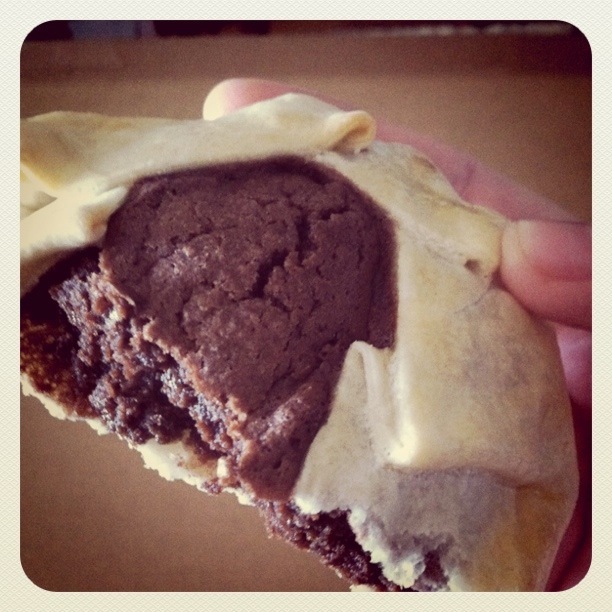 1) Chocolate Crostada. I am a sucker for anything with a buttery, flaky crust and the crostada hits the mark. As I mentioned before, I could usually care less about chocolate so it was shocking to me how hard I fell in love with this disk of perfection. It has this light and airy texture that is wonderful for summer and although I have never had a crostada from anywhere else, something tells me it wouldn’t hold a candle to this gem. 2) Apple Pie Cupcake. Generally I think cupcakes are mediocre at best and never something I would crave AND I really dont like apple pie. Whenever thanksgiving comes around I eat the apple pie just so I can scrape out the apple gunk and eat the crust so I must say that I was not looking forward to this one. Son of a… Not only has Society Bakery now turned me into a chocoholic but an apple pie lover as well. How is this possible? I wish they had the ability to change my opinion on things perhaps a bit more critical such as wanting to go to the gym or caring about political matters. I digress. The cupcake is perfectly moist and is topped with a sugary frosting that is out of this world. THEN the frosting is topped with the aforementioned “apple gunk” which seems much more appetizing this time around. The spiced apple pie filling balances out the sweet frosting to make a treat that is out of control delicious. 3) Black and White Cupcake. This is what a cupcake should taste like, period. An old-fashioned treat for the chocolate lover, the vanilla lover and everyone in between! The black and white cupcake made myself and each of my taste testers roll our eyes into the back of our heads and say “Oh my goddddd” with a mouthful of frosting and cake that would make our mothers blush. I wish every cupcake in the world tasted like this one. 4) Brownie. 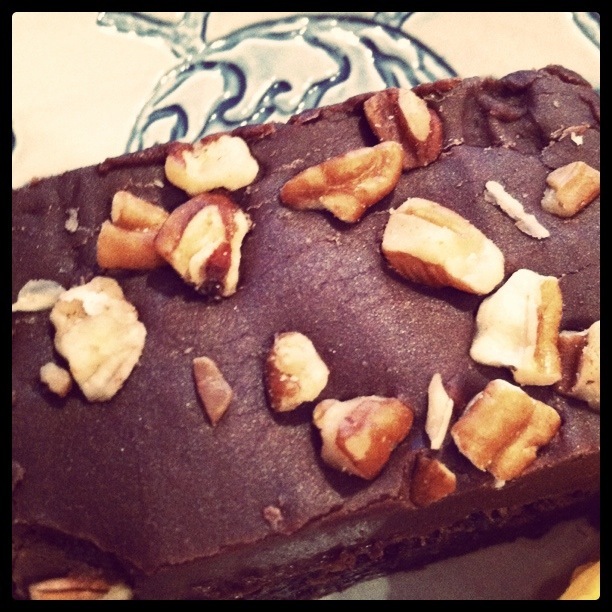 Society Bakery’s website describes their brownies as “4×4 squares of heaven” and boy, were they right. They are fudgy. And cakey. And smooth. And nutty. And chocolaty. And melt-in-your-mouth delicious. I really don’t know what else to say besides the fact that you should hightail it to Greenville Ave immediately to pick one up. Society Bakery not open at the time? It’s ok, I’m sure they won’t mind you taking a nap against the front door while you wait! 5) Cookies. 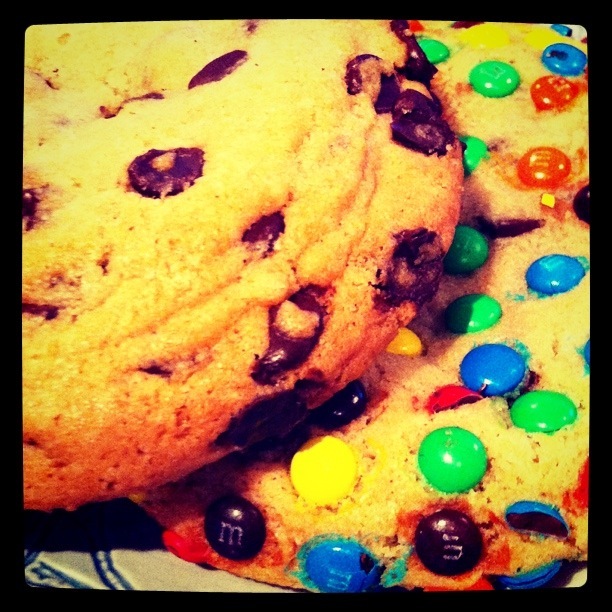 Somehow, someway, Society Bakery has mastered the art of making two cookies ONE. I would wash dishes for years in order to find out how to make cookies this good. They are literally layered just like if you baked the cookies halfway then stacked one on top of the other. Even if they didn’t taste that great (which they DO) the sheer size of these guys is impressive. Only one thing comes to mind while writing this and trying to describe my feelings towards these delicious mating treats and that is “hom nom nom nom nom” as so eloquently put by Cookie Monster himself. I was able to try the M&M flavor as well as the traditional chocolate chip but my curiosity has left me wondering if my personal fav, snicker-doodle, ever graces the shelves of Society Bakery …. 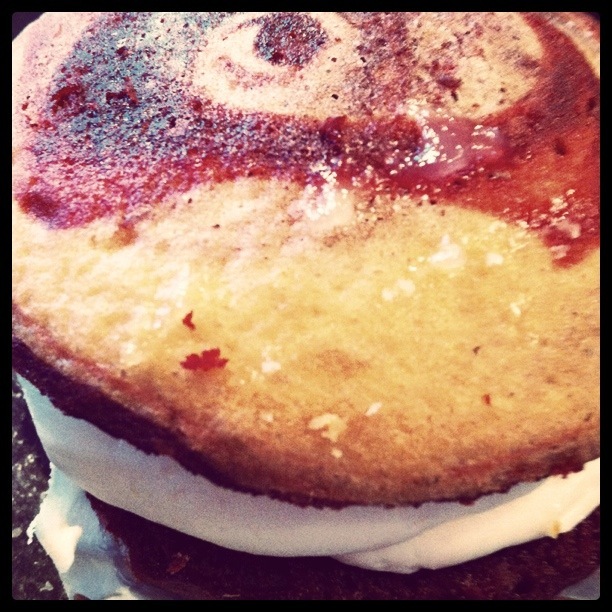 6) Peppermint Whoopie Pie. Whoa. Just whoa. It may be 150 degrees outside but its Christmas in my mouth. I can hear Santa’s sleigh and everything. Eating this was like taking a mini vacation to Winter time and I greatly appreciated that. It’s not too minty, not too sweet and following the common theme of Society Bakery it seems to have been meticulously test in order to deliver pure perfection. My family decided that these puppies were going to have to make an appearance on our holiday table but there is no way in hell I’ll be able to wait that long to chow down on another one of these! How are you still reading this? 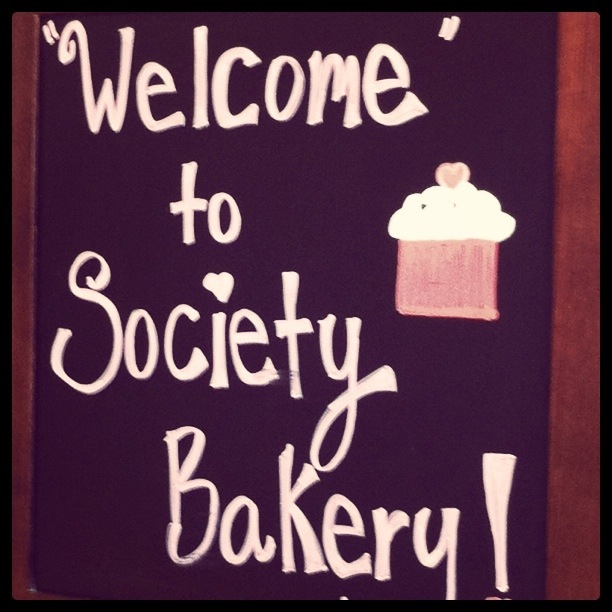 You should already be at Society Bakery or at least well on your way. You can’t go wrong with any of their delicious treats. Even though I just highlighted my favorites I must give an honorable mention to the carrot cake cupcake, vanilla petit four, triple chocolate cupcake, lemon square and the frosting on the chocolate peanut butter cupcake. WOWZA. Run, don’t walk to this subtly sweet neighborhood favorite!